'I will make an everlasting covenant with you . . .' (Isaiah 55:3). 'Covenant' is a major theme in the Bible, and many Christian thinkers across the centuries have made it the organizing principle by which they understand the Old and New Testaments. The biblical material is undoubtedly plentiful, but some specific texts are also much disputed. In this stimulating overview, Paul Williamson offers fresh readings of many passages that contribute to the theme of covenant, highlights its significance for biblical theology, and explores its role within God's unfolding purpose. He concludes that covenant is essentially 'a solemn commitment, guaranteeing promises undertaken by one or both parties, sealed with an oath', and that its primary function is to advance God's creative purpose of universal blessing, from its inception in the primeval period to its consummation in the new heavens and the new earth. 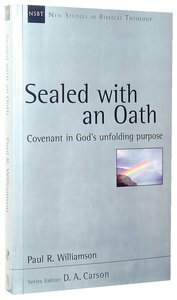 About "Sealed With An Oath (New Studies In Biblical Theology Series)"
Paul R. Williamson looks at the role of the covenant concept in Scripture and the meaning of this terminology. He then sets the idea of covenant in the context of God's universal purpose, and traces the idea through Noah and the patriarchs, the nation of Israel and the kingship of David. Lastly, he shows how the new covenant is anticipated in the Old Testament and fulfilled in the New. Williamson offers new insights into key texts and issues related to the theme of covenant. He is not afraid to challenge established positions. One example is his dual-covenant approach to God's dealings with Abraham. His robust scholarship will be appreciated by scholars, lecturers and students in theology, ministers and all who have a serious interest in the covenant concept.